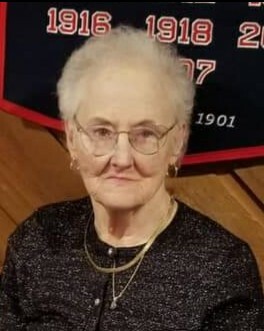 Wolcott – Barbara A. Gerhard, 85, passed away on Monday, December 3, 2018. She was the wife of the late Robert E. Gerhard. Barbara was born in Waterbury on January 28, 1933 to Henry and Mary (Manthey) McGrath. She enjoyed bingo and was an avid Red Sox fan. She was well known for her green thumb, and loved gardening both indoors and out. Most of all, Barbara loved her family dearly and enjoyed hosting holidays at her home. Barbara is survived by her sons, Robert Gerhard Jr.; James Gerhard; Ronald Gerhard; and Thomas Gerhard; her daughters, Diana Schmid; Debra Gerhard; Sharon Pilloise; Cheryl Dichele; Brenda Maldonado; Sandra Gerhard; Darlene Gerhard; and Maggie Gerhard; her sister, Mary Ruggiero; 19 grandchildren; many great-grandchildren; and several nieces and nephews. Including her husband, Robert, Barbara was predeceased by her son, Daniel Gerhard; daughter, Kimberly Gerhard; and her sister, Marion Lecchi. Calling hours will be held on Friday, December 7, from 5:00 p.m. to 8:00 p.m. at Woodtick Memorial, 420 Woodtick Road, Wolcott. A funeral home service will be held on Saturday at 11:30 a.m. Burial will follow in Edgewood Cemetery. In lieu of flowers, donations may be made in Barbara’s name to the Wolcott Dog Pound, 225 Nichols Road, Wolcott CT 06716.